My sister found this shoe pattern on Ellen Hutson’s website . The template is free to download, but you have to figure out how to assemble it yourself! This is great for holding a few treats. I added a button on the top and some wispy/stringy ribbon all around. A few gems on the heels, and it is finished. Using fun patterned paper makes a difference. My sister found this fun website of Ellen Hutson. One fun thing she has is a free template for a cowboy boot. It’s perfect for holding candy or little treats. Here’s my rendition. The boot comes in two parts, the top and bottom. I’d probably make a change or two, but they are pretty cute right off the bat! For added interest, I punched holes at the top, added a ribbon, glitter penned the dark design on the flower area and added a few gems. Tip: The pattern doesn’t come with directions. I believe the top part is supposed to set inside the bottom part. I put it on the outside and it didn’t work completely right! 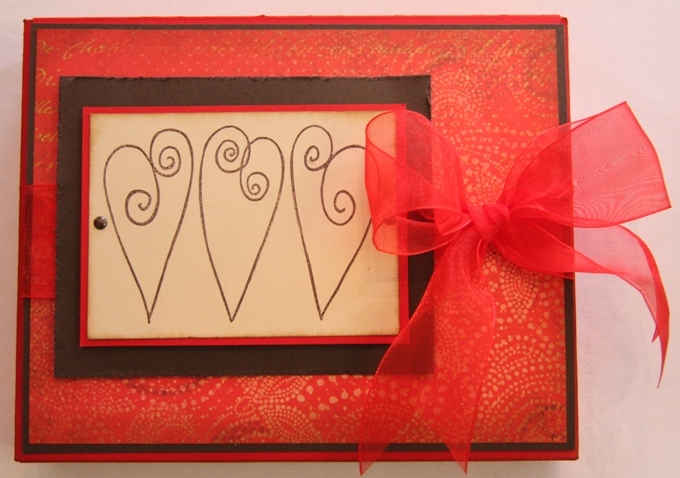 For the love in your life, this Valentine box is beautiful and functional! Make sections between your goodies to maximize your space and keep things in place. The top opens like a cover to reveal a window that you can see the goodies through. The lid can be removed to get the goodies! The hearts are from Hero Arts. The paper is red linen. The other paper is brown, patterened, and cream. 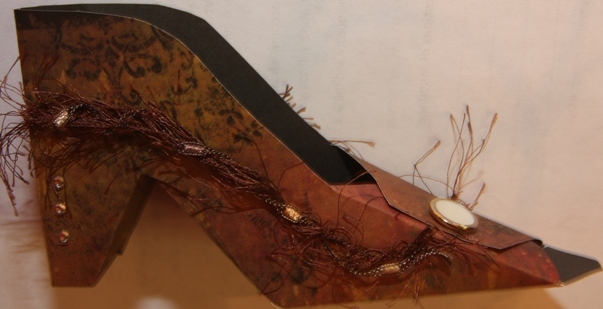 Brown brads decorate the front as well as a large red ribbon. 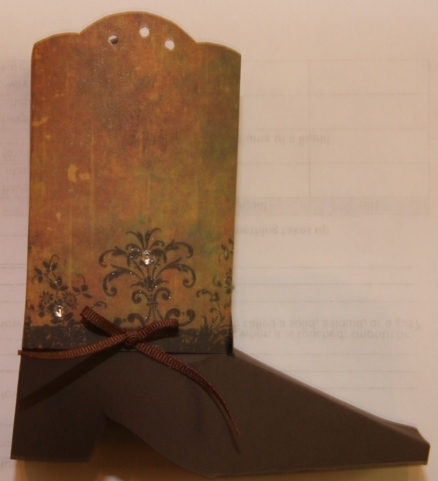 The edges of the cream and patterned paper are distressed in Tim Holtz distress ink (brown), and the brown layer under the hearts is distressed with scissors. Lift the flap of the lid to see what’s inside! A transparency covers the opening to keep things from coming out. The “I Love You!” stamp is from My Sentiments Exactly. The brown paper beneath the saying is distressed with scissors. 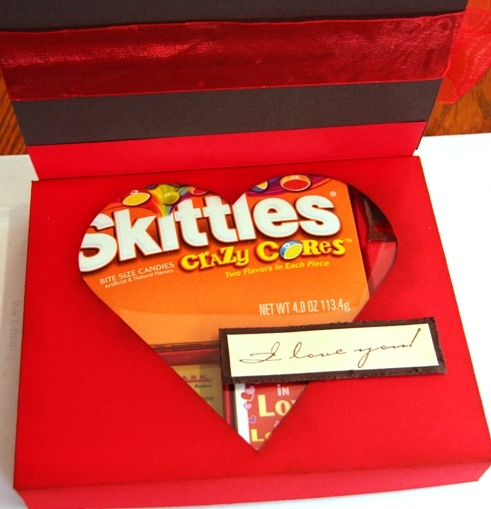 The box holds a box of Skittles, love lottery tickets, a movie gift card, decorations, and a spot for a coin to scratch the cards. Each section has dividers to keep things in place. 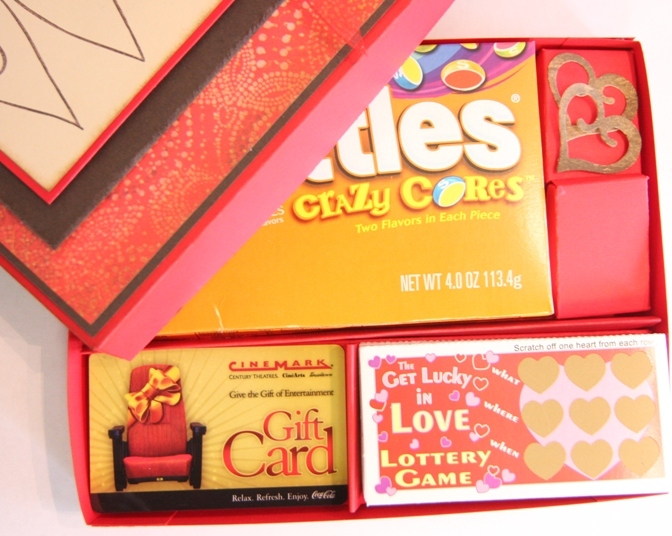 Little boxes were created to elevate the heart decorations, the gift card and lottery tickets. My husband gave me a great suggestion on how to improve this box. He kept trying to lift the brown part thinking there was a card on the top of the box. What a great idea! 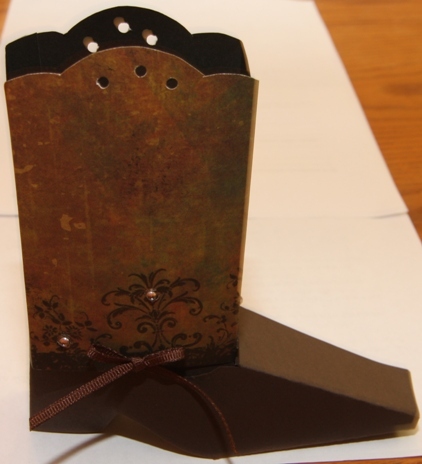 A card on top that decorates and holds the greeting! Why didn’t I think of that? 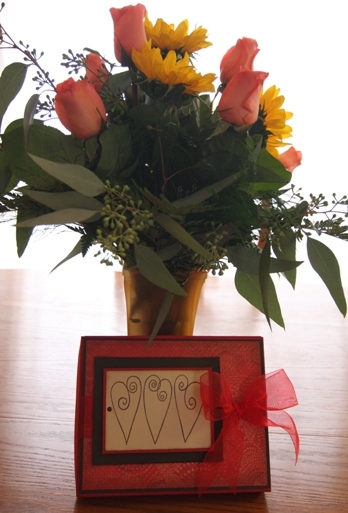 Here is the Valentine gift box next to a vase of flowers my sweetheart husband gave me. They look good together, just like us!